Quinoa has become a very popular health food for good reason. This unique grain is easy to digest, gluten free, and has a relatively high protein content. Quinoa is a psuedo-cereal like rice and barley. Compared to other whole cereal grains, quinoa has a similar texture, and requires similar cooking methods. What make s quinoa stand out as a superfood is its essential amino acid content. Amino acids are the building blocks that create proteins. Essential amino acids can’t be synthesized by the body and therefore must come from out diets. The most common sources of essential amino acids are found in animal proteins. Quinoa is one of the rare plant-based sources of essential amino acids. This property makes quinoa especially appealing to vegetarians and people who want to reduce their consumption of animal products. 100 grams of quinoa contains 14 grams of protein. In addition to being a good source of protein, a serving of this super food contains 7 grams of dietary fiber and is high in magnesium and iron. Quinoa also happens to be an easily digestible, gluten-free grain. This make quinoa a great choice for people with food sensitivities. This recipe is easy to cook and keeps well in the refrigerator. The instructions make four 1/2 cup servings. 2 tea bags, flavor of your choice. Fruit or aromatic flavors are a good choice. Let the tea steep in the water for the amount of time indicated on the package. Rinse the quinoa throughly. Warning: skipping this step will create a bitter quinoa. 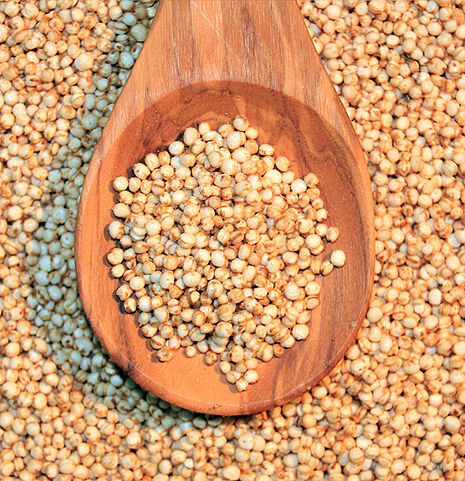 Unless it is pre-washed, all quinoa is coated in a soapy substance called saponin. Saponin tastes bitter and will affect the flavor of your quinoa if you don’t remove it. Toast quinoa. Put the quinoa and ground cinnamon in a sauté pan on medium low heat. Stir constantly. As the water evaporates the quinoa will start to pop. 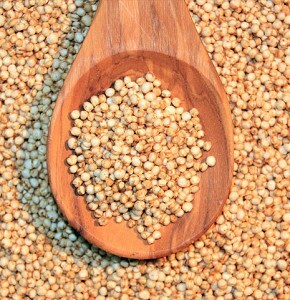 The quinoa is finished toasting when it is a golden-brown color and it’s omitting a nutty smell. Add the two cups of tea and the stick of cinnamon. Turn down heat so that the quinoa is just simmering. Cover the pan. Let the quinoa cook covered for about 15 minutes or, until the water evaporates. Once the quinoa is finished transfer to a serving bowl and toss with fresh berries. This recipe lends itself well to variety. You can alter the flavor by trying different teas or by mixing in other fruits, or even some nuts. Apple spice tea, with sliced apples and cranberries would be a great combination for fall! There are many grains you can choose to prepare for breakfast. However few have the nutritional benefits of quinoa. This recipe will add variety to your morning routine and essential amino acids to your diet.